After 12 years NACA still prefers ScandMedia as their publisher | Scand-Media Corp., Ltd. In September 2003 Khun Suchaya “Pum” from Scand-Media made a call who turned out to be the first step of a 12 years relationship. Khun Pum was Graphic Designer but had a good eye for new opportunities. She had found a potential client; the intergovernmental organisation that promotes rural development through sustainable aquaculture, or just recognized as NACA. 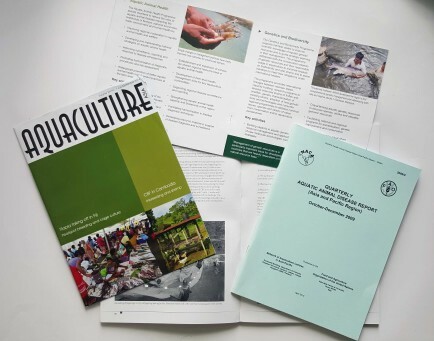 NACA was conceived already in 1976 during end of the FAO-convened Kyoto Conference on Aquaculture – but it was first in 2003 when Scand-Media contacted the organisation had their first newsletter in print published. Simon Wilkinson has been the Coordinator of Communication Programme in NACA since 2001, and he remember the day he received an e-mail from Scand-Media. “The timing was perfect. At that time we at NACA were trying to work with another publisher. It looked like our wish to print a newsletter would be a unsuccessful mission, because our current publisher was technically useless. They did not speak English nor did they meet our requirements,” Simon Wilkinson says. They gave Scand-Media a chance to prove they could serve NACA better. Shortly after, NACA could present their first newsletter in print. “It was in black and white,” Khun Pum recalls. Three years after, ScandMedia began printing NACA’s newsletters in colour, and also began printing NACA’s own magazine: Aquaculture Asia. Today, Khun Pum has advanced to the position of Marketing Manager for Scand-Media, and she believes she knows the reason why NACA has been publishing with Scand-Media for more than a decade. “We meet their needs. We provide high quality service and make sure everything is checked before printed. At the same time, we always deliver the printed material in time. We have never had any delays,” Khun Pum tells. Marketing Director Patcharee Lae-ya West, agrees. According to Simon Wilkinson, the secret behind the long relationship is the good communication together with the proactive people from Scand-Media. Not only are they easy to work with, but they also are very attentive on the details, he says. It seems it is this kind of relationships who will last forever. “There is no reason to stop working with them. As long as we do print, we want Scand-Media as our publisher” says Simon Wilkinson. Scand-Media’s founder, Gregers Moller, is fascinated with the long term cooperation with NACA. “Looking back, we have been on an amazing journey together,” says Gregers Moller. This year, 2015, the NACA reached a total of 1 million Thai Baht in payments to ScandMedia over the combined period of 12 years of cooperation. Scand-Media Corp. Ltd. is a printing company in Thailand and a graphic design studio producing creative marketing materials for a wide range of mostly international organisations in Thailand including foreign chambers of commerce, international associations and non-governmental organizations in Thailand. NACA is an intergovernmental organisation that promotes rural development through sustainable aquaculture. NACA seeks to improve rural income, increase food production and foreign exchange earnings and to diversify farm production. The ultimate beneficiaries of NACA activities are farmers and rural communities. NACA’s partners include organisations such as FAO, United Nations Development Programme, the Asian Development Bank, World Bank, OIE (World Animal Health Organisation), the Mekong River Commission, ICLARM, SEAFDEC, APEC, ASEAN, European Union, DANIDA, DFID, ACIAR, AusAID, DANCED, IDRC, IFREMER, NORAD, the Asian Institute of Technology, World Wide Fund for Nature, MacArthur Foundation and the Rockefeller Brothers Fund. This entry was posted in News and tagged in design, graphic, printing business, publishing.